The Story of Propeller Brewing Company – Halifax, N.S. 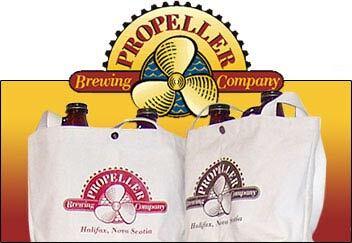 Propeller Brewing Company is one of the best known and loved craft breweries in Atlantic Canada. In early July I had the chance to have a beer with company owner John Allen and compile the information for this profile. In the mid-1990s John was looking to get out of film business where he worked on the prop side of the business. As someone who started homebrewing in the early 1980s, moving into brewing professionally was the next logical step. John purchased the original equipment for the brewery in Victoria, B.C. and took the opportunity to meet with local brewers to get their advice on starting up a brewery. Jim Pryor, who brewed in Britain for Bass and Whitbread, is someone he met online while preparing his business plan and also offered a great deal of assistance in starting up the brewery. Propeller Brewing Company opened its doors in July 1997 at its current location at 2015 Gottingen Street in Halifax. The location has previously served as a strip joint, movie theatre, café and Carpenters Union Hall. In addition to the brewery, the location has a store front, the Prop Shop, where growlers, bottles of their beer and Propeller merchandise can be purchased. Bobby Zacharias has been the brewmaster at Propeller for the past four to five years and studied brewing in Scotland at the Heriot-Watt University and also took a year long course at the Siebel Institute of Technology and World Brewing Academy. John originally met Bobby years ago and he joined the Propeller team with the previous brewmaster. Tracy Phillippi recently joined the Propeller Team. She servers as a brewer and also helps out Andrew Cooper on the sales and marketing side for Propeller. The Wisconsin native has completed the BJCP, has been a regular contributor to TAPS magazine and in the past has been heavily involved in the Toronto craft beer scene. Propeller is currently producing 18 HL batches and brew a total of 18-19 times per week with 3 to 4 batches per day being produced. They are currently looking to order a new system that will double their capacity as they are struggling to keep up with demand for their products. They are planning on expanding around January as they are far too busy to do so this time of year. Last year they sold a total of 7500HL and this year are on pace for 8500 HL. Approximately 75% of their sales is bottles with the balance coming in draft. Growlers have been a huge success since they’ve launched them in 2006. They sell on average 110 growler fills per day (based on 365 days) and have sold over 300 per day on peek days. They have experienced 15 to 20% growth fairly consistently and this year are up 12% so far. They sell the majority of their beer in Nova Scotia followed by Ontario, British Columbia, New Brunwick and Alberta. They have sold their products previously in Newfoundland and Manitoba but due to the need for critical mass marketing support, they have abandoned those provinces and focused on other areas. Extra Special Bitter (ESB): Our ESB is a rich, full-bodied English-style bitter, brewed with carefully selected malts and hops. This copper coloured, English styled ale is our best seller. Smooth, Full bodied and All Natural, like all our beers. IPA: Not for the faint of heart. True India Pale Ales had to withstand long sea voyages before quenching the thirst of cranky British troops stationed in India. Our IPA is true to this style, it’s bracing, bitter and higher in alcohol (6.5%alc./vol) and made with the trademark Propeller quality. It’s full-bodied ale for full throttle beer lovers! Pale Ale: Advances in malting techniques made possible paler coloured malts and heralded the arrival of Pale Ales onto the brewing scene in the 1800s in Britain. The most famous Pale Ale brewers came from Burton, where the hard water perfectly suited this new style of beer. Propeller “Burtonizes” its water to emulate this famous style. Crisp, hoppy and dry, Propeller Pale Ale is a delightful interpretation of a classic British brew. Honey Wheat Ale: Our Honey Wheat Ale is brewed with a blend of barley and wheat malts, with just a hint of Nova Scotia honey. The honey used is high quality fruit blossom and wildflower honey made in the Annapolis Valley. This honey is gently blended into the kettle late in the boiling process. Propeller Honey Wheat is fermented at a slightly lower temperature than our other Ales. This provides a cleaner, smoother beer and also ensures the delicate flavours provided by the addition of Honey are uninhibited. Light and refreshing, this is a year round favourite! London Style Porter: This beer style was created in the mid-1750’s. A dark full-flavoured beer but smoother and less bitter than stout. Made with softened water, Propeller London Porter is a blend of pale, roasted and chocolate malts, hopped with English and North American varieties. Porter was the drink of the masses long before lagers or modern ales were fashionable. The name Porter originated because this strong, nourishing drink was reputed to be the favourite beverage of the hard working porters of London’s Covent Gardens. Pilsner: Pilsner is a style of lager that originated in Plzen (pronounced Pilsen), Czechoslovakia in 1842. Prior to that time, most beers were made with top-fermenting yeast and were dark in colour and somewhat hazy. In 1842, an innovative Czech Brewery used a ground-breaking technique of methodical bottom fermenting with a new strain of yeast. The resulting brew, Pilsner, was a refreshing golden and bright beer that has now been adopted by breweries all over the world. Propeller Bohemian Style Pilsener, is a refreshing brew in the classic lager style of Bohemia. Made with a blend of Canadian and European malts and prized Noble hops, Propeller Bohemian Style Pilsener displays classic Euro-lager characteristics: a slightly sulphurous nose, distinctive Continental hop aroma, a light malt sweetness and a refreshing bitter finish. Revolution (RIS): This beer was born for greatness. Sent by English brewers via the Baltic Sea to the court of the Czars, Russian Imperial Stout was brewed to very high gravities and allowed to ferment on the long voyage. The result? A dark, strong and bracing brew. Propeller’s version weighs in at a whopping eight percent alcohol content, with a deep, rich, black colour. The taste of alcohol is well masked by the intense hop bitterness, extreme roasted malt and dark fruit notes. Propeller Brewing Company has brewed and bottled this unfiltered ale each year since 2006, making Propeller the extreme brewing pioneers of Nova Scotia. This seasonal offering is only available at the Propeller Cold Beer Store on Gottingen Street, and select private retailers in Halifax. Pumpkin Ale: In the fall of 2004 we created a Pumpkin Ale at the request of the Town of Windsor’s Pumpkin Festival and a fall classic was born. We brew this ale using Howard Dill’s® world famous Atlantic Giant Pumpkins® with a special blend of spices – this of course in addition to the usual ingredients: highest quality malted grains, hops, water and yeast. It’s the next best thing to pumpkin pie. This one goes fast so make sure you mark your calendar for this October. Double IPA: Propeller Double IPA is a full bodied, American style Double India Pale Ale that is brewed with premium Pacific Northwest hops and a rich blend of 2-row Pale and Crystal malts. Following fermentation it has been heavily dry hopped (a process that enhances the aroma without imparting bitterness in beer) giving this bold brew its big west coast nose. Double IPA delivers a huge amount of piney, floral, and citrusy hop aroma and flavour from start to finish that is balanced by sweet malt flavours. At 8.2% alcohol by volume and 85 IBUs, Propeller Double IPA is not for everyone… It is a TRUE hop bomb, for TRUE hopheads. Occasionally, Propeller will release a “One Hit Wonder” limited release beer. John talked about how the brewers love brewing the One Hit Wonders as it allows them to experiment and create different beers. He also explained as a microbrewery (and not a brewpub) he needs to focus on consistency of their regular products which limits the amount of “one of” beers they can produce. Propeller has produced Alpha Dog Wet Hopped Collaboration Ale with Sea Level Brewing and also an Imperial Extra Special Bitter with Hart & Thistle. John hopes they’ll be able to do both collaborations again this year. Propeller used Maritime Malt last year for one of their “One Hit Wonders” and also for their collaboration brew with Sea Level brewing. They use Annapolis Valley honey and Howard Dill pumpkins for their pumpkin beer that is available in the Fall. Propeller is not a regular attendee at beer festivals (especially those not focused on craft beer). They’ll attend a festival if there is a marketing rationale for it, normally if they are looking to enter a new market. He’s not interested in attending “giant open bar” festivals where he needs to donate his beers to someone else who is making a profit on the tickets. Because most of the beer festivals are so busy and crowded it is more about handing out beer than it is a real opportunity to market their product. Considering how busy Propeller already is, coordinating attendance at beer festivals and giving away product that would otherwise be sold doesn’t make sense. He’d also like to see more of an emphasis on pairing with foods at festivals. Propeller did attend this initial Saint John BeerFest earlier this year and also a beer festival in Toronto. John also mentioned that he is giving some thought to organizing a true craft beer event for this Winter. John and Bobby attended the Craft Brewers Conference in San Diego a few months ago. While they do not attend every year, they do go when there is specific information they are looking for and it also serves as a good networking opportunity although John is already well connected within the industry. Propeller has stopped submitting their beers for awards the past few years. They have previously won multiple awards at the Canadian Brewing Awards and also at the World Beer Championships. John jokes that this is due to the high cost of plaque mounting but it has more to do with the time and effort involved in submitting their beers and they are more than comfortable with the fact that people love their beer. John also mentioned that for the past 10 or so years that the Coast has been running the best microbrewery award in Halifax they have won for all years but two. Propeller has been heavily involved in community projects. Propeller has been involved in events related to the North End Community Health Center, Northern Lights Lantern Festival , have donated a labeller for a charity to create salad dressing that benefits Inner-city kids and have been involved in other community events. Propeller has a website, a Facebook Page, and a very active Twitter account ( @propellerbeer ).